The field takes the green flag at Phoenix. The best way to describe the racing at Phoenix on Sunday is by using the off-handed post-race comment made by the driver of the No. 99 car, Carl Edwards. He said someone should call actor Will Ferrell about doing a sequel to Talladega Nights called "Phoenix Afternoons." Yes, it was that dramatic. So much drama that I doubt that any filmmaker could script so many odd twists, not even a screenwriter for Lifetime Movies. Sometimes life really is stranger than fiction. We certainly expected great competitive racing and a few hot tempers. But we also got to see: a 44-race win drought come to an end; a five-time champion's fall from grace; "Boys have at it" to an extreme; an oil-slicked, car-collecting wreck on the last lap; and, oh yeah, a huge brawl after Clint Bowyer's crew chased Jeff Gordon, with lengthy footage of Clint Bowyer running through the garage area to join them. Whew! So where do my pre-race 5 Questions stand? Will Jimmie Johnson retain the lead going into Homestead? Remarkably, no. Jimmie Johnson finished the race in 32nd after a blown tire took him into the wall, and most likely, his championship hopes as well. With 77 laps to go Jimmie noticed a slight vibration starting in the right front, then coming off of Turn 4, the tire went down and the No. 48 car hit the wall. Thirty-seven laps later after going into the garage, Johnson returned to the track and finished 38 laps down. Will Kyle Busch finally get a win in a 2012 Chase race? No. Kyle Busch started on the pole, led four times during the race as well as the most laps at 237. He finished in third place. Kyle has scored the fifth-most points in this year’s Chase. The other truly remarkable stat that I'm sure leaves Coach Gibbs scratching his head is that this is the 7th or 8th race of the year that Kyle led the most laps, but couldn't bring home the win. Will Brad Keselowki and Paul Wolfe make another risky call or play it safe? The No. 2 team, driver included, made a mistake and a risky call, but recouped the standings lead anyway. On Lap 19 while trying to leave after a pit stop, Keselowski dropped the clutch and stalled his engine. Later, during green flag pit stops he stayed out to lead a few laps, then pitted at Lap 134. Jimmie Johnson pitted at Lap 135, and Keselowski just beat him to the start-finish line. Does Denny Hamlin have any fight left in him? Yes, and no. Denny Hamlin led twice for a total of 46 laps and finished the race in second place. He gained two spots in the standings and is in fifth place, 62 points behind the leader. For Hamlin, the Phoenix race must have seemed like a "what could have been" moment, particularly if you look at the fact that only three drivers scored five race wins this season: Brad Keselowski, Jimmie Johnson and Denny Hamlin. 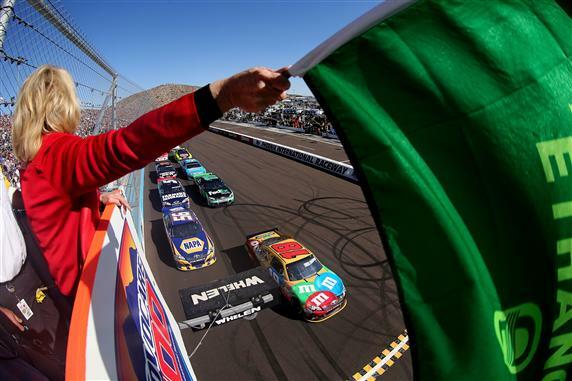 Will this race showcase Hendrick Motorsports or Roush Fenway Racing drivers? Neither. Although Kasey Kahne came in at a respectable fourth place, neither of these racing powerhouses really gleamed at Phoenix. Jeff Gordon earned some big headlines and some hefty penalties though -- a $100,000, fine, docked 25 driver points and probation until Dec. 31 for his on-track altercation with Clint Bowyer. In the end though, Roush Fenway Racing got better finishes -- an average of 10.6 to Hendrick Motorsports' 21.7. Enjoy the final race at Homestead and the end to this dramatic year of racing.